Gridskipper said: "A secondhand bookstore near Odéon with a nice atmosphere and a good selection, the San Francisco Book Company buys used titles for about a euro a book, or twice that in store credit. There's a free box in front of the store if you're really desperate or want to make a donation." Another gem in the selection of second hand English bookstores in the French capital. San Francisco Book Co has all the elements that we're looking for when judging the quality of a second hand bookstore - shelves full of books, specific atmosphere and friendly prices. Instead of adding more compliments, we'll just say that we've spent almost an hour browsing around the bookstore and although our backpacks were really heavy and we still had several weeks of traveling ahead of us we couldn't resist buying a few books. Probably the most notable quality of this bookstore, which gives it an edge over the rest of the Parisian second hand English bookstore scene, is that the prices are very affordable. The books in front of the store are available at bargain prices which range between 1 and 4 Euros, and the selection is quite ok. As for the titles stored inside, the prices of most of the titles are still very much acceptable to say at least, and the selection is great. Especially the fiction section stands out both in terms of quantity and quality. 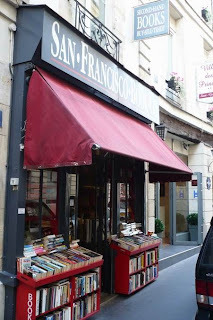 The San Francisco Book Company, located on the left bank, opened its door to visitors in 2005. It specializes in second hand English titles, mostly affordable paperbacks, but they also offer some rare titles and first editions. They also buy books, you can find their buying policy on their website. Besides the mentioned fiction section, which is the pride of this bookstore, you can find well-stocked sections dedicated to music, art, movies and theater, social sciences, sports, travel or cooking. Add the helpful staff and the our review of this bookstore can only end with two words - highly recommended.